Bonjour! 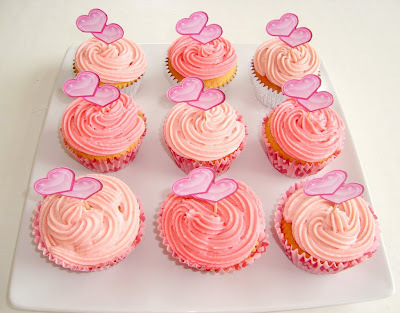 Valentine's Day is only a few days from now and I would like to show you my special Valentine's Day-themed cupcake called "Sweetheart Cupcakes". These cupcakes are just plain vanilla cupcakes, so you could use any recipe you'd like, but they're really cool when you slice them vertical because they have three different colors (although the last color didn't come out as red as I had hoped for). I got the idea from AllRecipes.com and I added a cupcake topper that I made myself. - Preheat oven to 350 degrees. Line standard muffin tins with paper liners. Sift together both flours, baking powder and salt. - With an electric mixer on medium-high speed, cream butter and sugar until pale and fluffy. Add eggs, one at a time, beating until each is incorporated, scraping down sides of bowl as needed. Beat in vanilla. Reduce speed to low. Add flour mixture in three batches, alternating with two additions of milk, and beating until combined after each. - Divide batter evenly among lined cups, filling each three-quarters full. Bake, rotating tins halfway through, until a cake tester inserted in centers comes out clean, about 20 minutes. Transfer tins to wire racks to cool completely before removing cupcakes. 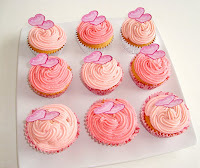 - Fill cupcake liners ⅓ full with batter; set aside. 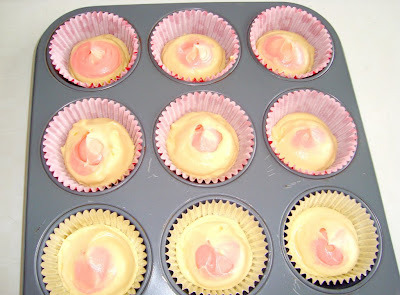 - Stir 4 drops of red food coloring into the remaining bowl of batter to make the batter pink, stir in the raspberry oil. Pour ⅓ of pink batter into a resealable plastic bag and set aside. - Mix more food coloring into the remaining bowl of pink batter until it is an orange/red color and pour the batter into a resealable plastic bag. Cut a corner off the bag, stick the open tip into the center of each cup of white batter and squeeze in about two tablespoons of red batter. 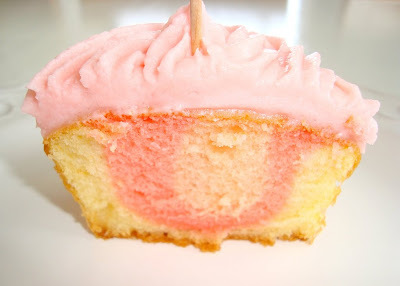 - Cut the corner off the bag with the pink batter, stick the open tip into the center of the red batter and squeeze about 1 tablespoon pink batter into each cup. - Combine ingredients in a medium-sized bowl, and mix with an electric mixer until smooth. Add more milk if needed. This is how the cupcake batter looks like with the three different colors used. Waow, looks equally gorgeous in and out!Could you believe I never had a cupcake???? How sweet and I love the color of the cakes. Yum. It looks unbelievably tasty and beautiful!Such an art to master. Wishing you the most wonderful valentine's Day weekend filled with love and joy. If you live in Paris, there is this cupcake-bakery called Berko. It's on Isle Saint Louis, 23 rue Rambuteau. How pretty! I love the light pinks--just pink enough but not so much that it becomes unappetizing. Yum! 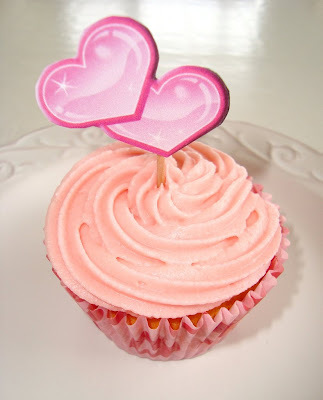 This is about the cutest variation on a Valentine cupcake that I have ever seen! I love, love, love the three colors inside. Very, very nice job on these adorable cupcakes! 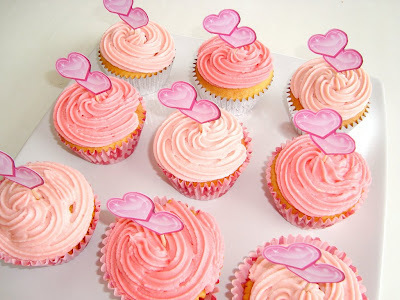 Fabulous cupcakes,i love the three colors! These look wonderful, I like the lollies. Darling thanks so much for your sweet and caring comment. I treasure our friendship and wanted to wish you a lovely weekend and a love filled Valentine’s Day. By the way the cupckaes are divine...too good to eat. Aww these are so adorable! This post is gorgeousdeliciousheavenlysweet ! Wishing you a Wonderful Warm (V-) Weekend! 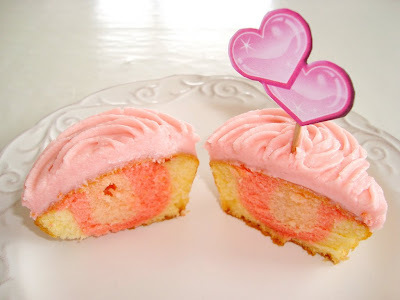 I made this cupcake recipe as a plain cupcake, no fancy colors/layers. I have to say that these rival the best cupcakes I ever had - from Magnolia's in NYC!!!! If you haven't tried this recipe, you must! It is the only recipe I use for cupcakes now. granulated sugar and has - of all things - flour in it!